In April, a notice is sent out to each customer reminding them to call for their appointment for the spring turn on. We do have an automatic turn on list in which we contact the customer. If you would like to be added to this list, please notify our office. SLOWLY turning on inside main sprinkler system water supply valve, filling up and pressurizing mainline to system. Turning on and testing each zone to the sprinkler system on a zone-by-zone basis. Adjusting sprinkler heads as needed for the most efficient water coverage. Cleaning grass overgrowth from around sprinkler heads as needed. While checking through the system, the servicemen will also check for any type of repairs that may be needed to the sprinkler system. If any repairs are needed to the system, the homeowner will be notified and any repairs would be done at a time and material rate. 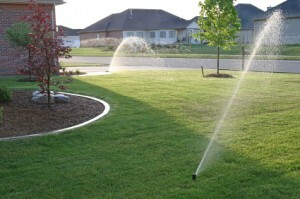 After the Spring turn-on and any repairs that are needed to the sprinkler system are complete, we would then set up the timer for the most efficient and proper operation .